Halloween is a very fun holiday. Halloween on crutches? Not so fun. In fact, it can be downright dangerous. Children darting around you from every side in the dark…all day activities…costume hazards…there’s bound to be something that will stall or even lengthen your recovery process. In order to make it through the day on one leg, here are a few safety tips. Tip #1: Acquire the Proper Lighting – In past years, a glow stick might have been enough lighting for you when you take your kids out trick or treating. This year, you really need to be able to see where you’re going. Make sure you take a bright flash light along and have someone shine it in your path at all times. Something as simple as a crack in the sidewalk could trip you up and bring you down. Tip #2: Keep Rest at the Top of the List – There are a lot of activities you could participate in on Halloween. There are class parties, neighborhood gatherings, trick or treating and plenty of other options. Other years, you might do it all and enjoy it. This year, however, you need to keep rest at the top of your list of activities. Choose your favorite event and then save your energy for that activity. Overextending yourself could put your recovery on a backward slide. Tip #3: Think about Costume Safety – If you plan to dress up this year, you will want your costume to be safe above anything else. That means it can’t have anything hanging from it that you could get tangled up in as you walk. It also shouldn’t have a mask that restricts your vision. And it should be loose enough that you aren’t restricted in your motions in any way. You might have to sacrifice some of the appearance of your get up, but when you are injured and on crutches, safety has to come first. Tip #4: Consider Event Alternatives – It might be hard to consider skipping out on trick or treating the old fashioned way, but when you are on crutches, you will have to make some sacrifices for your health. 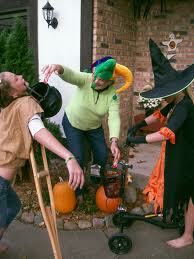 If you don’t feel you can trick or treat with your kids in a safe manner, don’t despair. There are other options likely available in your community. See if your local mall has a trick or treat night, for example. You would be inside in a well lit environment where you could sit and rest on a bench any time you need a break. Tip #5: Look into Alternatives to Crutches – If you don’t feel completely stable on your crutches, there are other options on the market from Goodbye Crutches. The Hands Free Crutch, for example, straps to your bad leg and acts as a replacement. It looks like a peg leg, which is great for Halloween, and it allows you to use both your hands to carry a treat bag and hold a child’s hand when crossing the street. The Knee Scooter is another great option. This wheeled device gives you better balance and stability, plus it allows you to keep up with anyone on two legs, no matter how fast they are. And the Seated Scooter is a wonderful way to get the rest you need despite how much you do since you will have a seat with you everywhere you go. 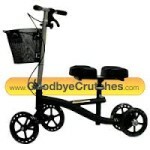 All three options are available from Goodbye Crutches along with many other recovery aid items. You might have to make a few adjustments to your plans this Halloween, but if you are able to stay safe and keep your recovery on track, they will be worth it. ‹ Are You a Member of the Broken Bones Club?